It took me awhile to attempt making pho from scratch, simply due to the handful of spices I don't usually use, the long cook time of the beef with bones, and just not wanting to dedicate the time in general to the overall cooking process. But with the Instant Pot, I am thrilled to make my soup in a fraction of the time. Making the broth is done in two parts. The first part involves cooking the beef to extract all the richness and flavor. The second part involves adding the spices to impart the complexity of the broth. Once the broth is made, everything else is easy! 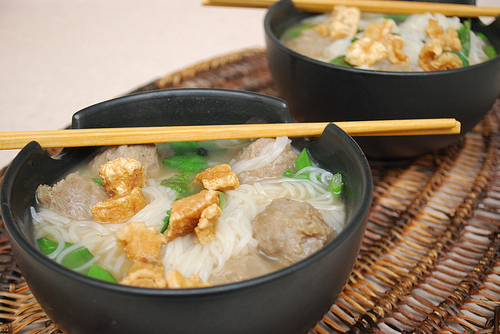 The meatballs and noodles can be prepared while the broth is cooking and any of your desired toppings or stir ins can be prepared in advance, My family loves building our pho soup bowls together where we have all the toppings out and each person can top as they please. You'll notice I included a recipe for homemade beef meatballs, but feel free to use prepared meatballs or your choice of meat, such as chicken breast, pork or even shrimp. Also, I had my rice noodles prepared in advance- either fresh rice noodles or dried rice noodles prepared per package directions - so I could add them when ready to serve. The noodles will warm up with the hot broth poured on top. You can also prepare the toppings in advance or while the broth is developing, to save time. Add the beef shank, oxtails, onion, garlic, star anise pods, cinnamon stick, clove, peppercorn, ginger, sugar, fish sauce and 8 cups of water into the IP pot. Press MANUAL and adjust the time to 30 minutes on HIGH pressure. Once at pressure, the display will reflect 30 (the number of minutes you initially set ) and will begin to countdown to 0 minutes. When the IP beeps after pressure cooking for 30 minutes, allow your IP to naturally release pressure for 15 minutes. While naturally releasing pressure, the display will reflect numbers counting up from 1. The numbers indicate how many minutes the IP has stopped cooking since it beeped (or how many minutes it has been naturally releasing pressure). No need to touch your IP while it naturally releases pressure. When the display reflects 15 (which is 15 minutes since the IP has beeped), turn the setting on top of your IP to venting. Doing so allows the IP to quickly release pressure. I use a wooden spoon to carefully turn the setting to avoid close contact with the potential steam. You may also want to turn your IP away from cabinets to allow the released steam to escape freely. The pin at the top of your IP will drop when all pressure has been released and it's safe to open. Using a slotted spoon, remove meat from pot and transfer to a large bowl; set aside. Using a slotted spoon, remove any whole spices and discard. Set a fine mesh strainer over a large bowl and carefully strain the broth to catch any solids; discard any solids. Rinse and dry your IP pot and return to the IP. Transfer the strained broth into the pot. Taste and season with more sugar and/or fish sauce to suit your taste preference. Rinse any scum (if any) from the meat previously removed and return back to the pot. Cover the processed beef mixture and chill in the freezer for another 30 minutes. Meanwhile, press SAUTE on the IP and bring a broth to a boil. Place the meatballs into the boiling broth and allow them to float and cook for about 7-10 minutes. To serve: Place some prepared noodles into a serving bowl and top with a few meatballs. Ladle hot broth over the noodles and meatballs in the bowl. Garnish with your choice of toppings.